​It’s always best to keep your hedges in good condition at all times because it might just be the first thing your visitors notice when they visit you. Pruning a hedge or a garden can be a daunting task, especially when it’s not done with the right tools. An electric hedge trimmer is a tool that can be used to prune, cut or trim hedges and shrubs. Due to the handiness of this tool, many models of different sizes, prices and capabilities are available in the market. This is why you have to carefully consider a lot of things before selecting the best electric hedge trimmer for yourself. What is an electric hedger and who is it for? ​How does the best rated electric hedge trimmer work? Our top pick for the best electric hedge trimmer in 2018 is the BLACK+DECKER LHT2436. It is one of the best hedge trimmers in the market, featuring a 40-volt Lithium-ion battery which gives you a longer battery life as compared to other available options. It also comes with features such as dual action blades and wrap-around front handle that make your trimming experience a nice one. The BLACK+DECKER LHT2436 comes with a 40 volts lithium-ion battery which is powerful enough to complete heavy-duty tasks. Lithium-ion batteries can hold charge up to 5 times longer than Ni-Cad batteries. With the Energy Star-rated charger, the battery recharges fully in just 1 hour. The charger displays a flashing light while charging to tell the battery’s status. 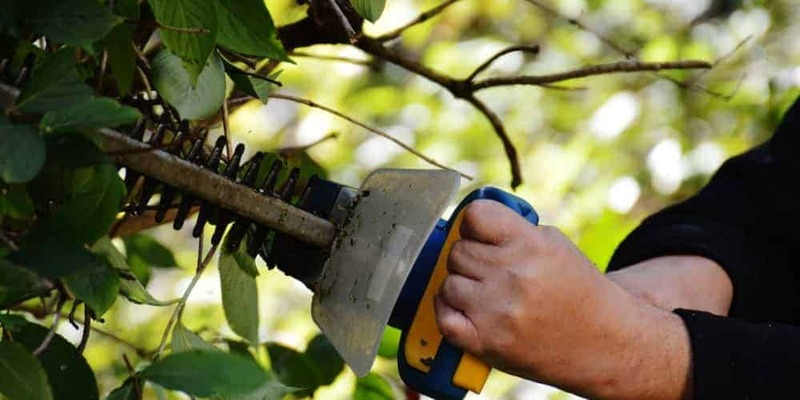 It uses a Power Drive transmission enabling you to cut much larger branches without stalling. The dual action blades also ensure about 40% less vibration during cutting. It also features a wrap-around front handle which offers a secure and comfortable grip when cutting vertically or horizontally. This hedge trimmer is suitable for gardeners on a budget, it is the least expensive of the five hedge trimmers reviewed here. It uses a 16" dual-action steel blade which reduces vibration when cutting. Powered by a 3.0-Amp motor, the BEHT100 is suitable for trimming branches as wide as 5/8". Safety is ensured with the cord retention feature that prevents you from accidentally unplugging the tool. This BEHT100 is relatively lighter than most hedge trimmers in this category, making it very easy to carry around while cutting. Another great feature integrated into this hedge trimmer is a T-handle and a full-length trigger giving you more control while cutting. Blades are only 16" long. The DeWALT DCHT820P1 uses a hooked-tooth blade design measuring up to 22" making it very easy to cut through branches up to 3/4" easily. The blade is also made from hardened steel which is more durable than other available options. This electric hedge trimmer features large and simple controls which can be easily used even when wearing a pair of work gloves. This hedge trimmer does not feature padding on its front grip, which makes the rotation of the trimmer easier and also excludes the possibility of the padding getting torn or ripped. Its lightweight and compact design make the trimmer easy to handle and move around reducing the stress on the operator’s forearms. The WORX WG255.1 is a lightweight cordless hedge trimmer that can be can be carried anywhere around your garden without difficulty. but it's easy to use and solidly built. It offers 2200 cutting strokes per minute, which is suitable for small gardens and light yard work tasks. This hedge trimmer features a blade cover made from aluminum making it easy to clean and more resistant to corrosion. The dual-action blades reduce the level of vibration unless it’s cutting through thick vegetation. ​Its blades are made from hardened steel which making it retain its sharp edge for a long period of time. It comes with a corrosion-resistant blade cover that protects the blade when transporting the trimmer. This electric hedge trimmer has an even weight distribution allowing you to use the trimmer at any angle for precision cutting. The lightweight also reduces the stress on the operator’s arm. Another great feature is its transparent hand and debris guard protecting you from the blades and allows you to cut with great precision. A great feature of this hedge trimmer is that it produces no emissions and runs very quietly. The dual-action blades help reduce vibration and consequently the fatigue that comes with it. It also features a cord retention hook preventing you from accidentally pulling out the trimmer from the electrical outlet while in use. A Lock-off switch located on the top of the handle prevents the hedge trimmer from accidentally starting. The GreenWorks 22102 also has a combined debris and hand shield, providing more safety to the operator. Precise cutting is ensured with compact design and even weight distribution. It’s a corded tool, you can have a trimming session for as long as you want. An Electric Hedge Trimmer is a gardening power tool that can be used to cut, trim or prune hedges. It is gradually replacing the use of manual shears, giving your hedge a cleaner and neater look in no time and without having to go through much stress. It´s the perfect tool to maintain your garden together with electric lawn mowers. An electric hedge trimmer is suitable for people who want to achieve a neat hedge look without having to go through the stress of doing it manually. When an Electric hedge trimmer is put on, the blades start to oscillate at a very high speed causing the movement of the blades forth and back along the cutting bar. This movement allows the blades to cut hedges effectively. The spacings of the blade teeth determine the cutting capacity of a hedge trimmer. The wider the spacing, the larger the maximum branch width that can fit in between its teeth. Most hedge trimmers come with teeth gaps of about 1 inch or more, though there are some that come with lesser gaps. A lower cutting capacity is suitable for leafy hedges with thin stems while a larger cutting capacity is needed for thicker plants. The type of blade is also an important factor to consider when choosing the best electric hedge trimmer. You can either select a single-action blade or a dual-action blade. A single action blade hedge trimmer uses a sole blade that moves along the cutting bar while a dual-action blade hedge trimmer comes with two blades which move in opposite directions offering more flexibility when cutting. The blade length also determines how fast you cut, longer blades help in cutting high hedges faster. You may opt-out for shorter ones if your hedges are not too high. A heavy hedge trimmer can be very difficult to handle and maneuver, lighter ones are easier to use. However, the weight of a hedge trimmer depends on the engine’s power and length of the blade. You should select a hedge trimmer that best combines weight and power that will suit your cutting needs. Corded hedge trimmers have the advantage of allowing you to cut for many hours without recharging or having to refill gas often. They are also more significantly lighter than cordless hedge trimmers. Nevertheless, the cordless hedge trimmers allow more flexibility in moving around when cutting. Gas powered hedge trimmers are also more suited for heavy-duty tasks than corded or cordless battery-operated ones. You can get the best regardless of the type you choose. If you’re getting a corded hedge trimmer, get one with a cord length that can reach the farthest point of your garden. When considering a cordless hedge trimmer, you should get one with batteries powerful enough to last through an entire cutting session in one charge. Apart from the basic features a trimmer should have, you should also consider the extra features such as laser cut blade, anti-vibration technology, ergonomic handle designs and safety features that will suit your specific needs. There are three major types of hedge trimmers, each having their positives and downsides. Corded Hedge Trimmers are usually the lightest as compared to cordless trimmers and gas-powered trimmer with weight between 5-10 lbs. They are relatively cheap suitable for light garden pruning. They are environmentally friendly, they don’t emit gases and their electric motors make little noise allowing for a safer environment. ​They can only be used where an electrical outlet is available. As long as you’re connected to an electrical outlet, you can work for as many hours as you want without any interruption. You need to get a trimmer with enough cord length to reach the location where the tool is needed. The cord can get in the way of cutting and pose a problem if not positioned properly. Cordless Hedge trimmers are not as powerful as gas-powered hedge trimmers. Rechargeable batteries are used to provide energy to the machine. They offer great flexibility in terms of maneuverability and handling as compared to corded models, you can trim bushes far from your home without using an extension cord. However, they can’t be used for a very long period of time without recharging the battery. Some cordless hedge trimmers offer up to 60 minutes of use after recharge while high-end trimmers can offer up to 120 minutes. If you’re opting for a cordless hedge trimmer, you need to select one that can take care of your cutting needs. Gas powered hedge trimmers use gasoline to power their motor rather than electricity. They are most powerful hedge trimmers available, having the power to perform heavy-duty tasks without difficulty and in little time. This probably the best choice for you if you need to cut hedges with thick stems and branches. On the other hand, they are quite heavy and can be very expensive to maintain, requiring constant refill for them to function ceaselessly. Their motor also makes a lot of noise when in use. The most prominent advantage of a cordless hedge trimmer is the flexibility it offers in allowing you to move around your garden without electric cables. Cordless hedge trimmers also offer lightweight as compared to gasoline-powered ones. If you want to be free from accidental cutting of electric cables, a cordless hedge trimmer is good for you. A gasoline-powered hedge trimmer is suitable for people with gardens where electricity supply is not accessible. An advantage over cordless hedge trimmers because is that they don’t use batteries and consequently, no need for constant recharging. However, gasoline-powered hedge trimmer can be very heavy and produce a lot of vibrations than other types of electric hedge trimmers. Corded hedge trimmers are the lightest of the three categories. They rely on electricity supply, so, their runtime is unlimited as long as you’re connected to a power source. They are also less expensive than the gasoline-powered hedge trimmers. Make sure you’re in a good physical condition before you operate an electric hedge trimmer. Do not operate if you’re fatigued or under the influence of drugs which might affect your sense of judgment. Always wear protective apparel and safety gloves anytime you’re handling a trimmer, this helps to protect you from the risk of getting injured. Also, try to avoid wearing loose-fitting clothes, scarfs, cuffed pants or anything that can come in the way of the cutting blades. Use your electric hedge trimmer only for cutting hedges, bushes, shrubs, and other similar materials. Using it for other purposes might damage the blades. Never try to use it for cutting the lawn, please use lawn mowers for cutting the grass of your yard. To avoid the risk of injury, carry your hedge trimmer horizontally with the grip on the front handle and the cutter blades behind you. Keep the hot muffler away from your body to avoid getting burned. If you’re using a gas-powered trimmer, fuel only in well-ventilated outdoor areas to avoid vapor pressure build-up inside the fuel tank. Make sure your hedge trimmer is unplugged and switched before you begin any maintenance work on it. After using your hedge trimmer, make sure the blades are in their proper position before you start cleaning it. Remove any residue left on the trimmer like plants and start cleaning form blades using a rag or a brush. If a sticky residue is left on your trimmer after cleaning, you can use soap, alcohol or kerosene to remove them. Lubricate your trimmer from time to time to prevent wear and tear of the machine’s parts. Before you start cutting, check your environment and make sure you’re within a safe working area. You can demarcate the area you’re working so as to avoid interference while you’re working. Don’t use your electric hedge trimmer in the rain or in wet conditions as this might result into electrical shock or damage of the trimmer itself. Hold your electric trimmer with both hands while working and keep the hot muffler away from your body. Stand with your legs apart while cutting to improve stability. Turn on the trimmer and start in a scything motion starting from the base upwards so you can clearly see the places you’re yet to cut. Keep the trimmer blades at the same height as you move from one place to another, this helps to maintain a cleaner cut. Be patient when you’re working with an electric hedge trimmer. Don’t be in a hurry to complete a trimming task and in the process, you get yourself injured. If you’re using a gasoline-powered hedge trimmer, your gasoline should not contain more than 10% ethanol so as not to damage the tool. Place a tarpaulin on the ground below your hedge while working so you can easily clean the floor after working. Place the tarp on a clean surface, so if there are any leaves below make sure you blow or rake them before placing the tarp. After a trimming session or when the tarpaulin is full, drag it into your wheelbarrow for disposal. A: Yes, to maintain a good cutting performance, you have to sharpen your trimmer blades about every 50 hours of use without having to wait until the blades start snagging on branches before sharpening them. A: A hedge trimmer like any other machine with metal blades start to stick after prolonged use without maintenance. You need to lubricate it regularly in order to keep the blades in top condition. A: Electric hedge trimmers are powerful tools used to trim or prune your hedges and shrubs. They make your work faster and neater than manual shears. A: Using the hedge trimmer in wet condition increases the risk of electric shock and tool malfunction. Never try to use your electric hedge trimmer to cut in the rain. A: Yes, when a trimmer blade is used for a long period of time or used wrongly, the blades become useless. It is better to change the blades in that situation. A: Yes. To prune rose bushes, you need to trim about one-third of the shrub by cutting outwards from the center at a 45-degree angle in order to maintain a full rose bush. A: Firstly, you need to get a pair of protective gloves and safety goggles so you don’t injure yourself when sharpening the trimmer. You then need to remove the bolts and screws holding the blades in place and use a metal file to push against each cutting edge back and forth until the edge looks shiny and sharp. Before filing, make sure you remove any dirt residue so as not to damage the file. File only the cutting edges ensure the file does not have contact with other parts of the hedge trimmer so as not to damage it. You can then test for sharpness by simply rubbing a sheet of paper against the blade’s cutting edge. The blades will slice the paper if they are sharp. Apply a layer of linseed oil coating to the blades to prevent them from corrosion. A: Clean your electric hedge trimmer by wiping it with a dry or slightly damp piece of cloth. Don’t use water to clean an electric hedge trimmer, it could damage the electrical configurations of the trimmer. If you use your trimmer every day, you need to clean the air filter, cooling fans and carburetor at least once a week and also the fuel filter and tank at least once a month. A: To lubricate an electric hedge trimmer, you need to first make sure the blades are not rolling and the trimmer is turned off. Then use a soft piece of cloth to gently apply a light layer of lubricating oil along the cutting edge of the blade. Sharpening the blades after prolonged use. A: There are many reasons why your electric hedge trimmer could be smoking, it might be due to burning out of the brushes on the motor or it might just be that your trimmer is long overdue for maintenance. You can change the brushes on the motor if they are burned out but it’s advisable to take your trimmer to a service center for full diagnostics of the problem. Our top pick for the best electric hedge trimmer in 2018 is the BLACK+DECKER LHT2436 40-Volt High-Performance Cordless Hedge Trimmer. It is a powerful hedge trimmer with a 40V battery that provides it with a lot of power and runtime. It can cut branches up to 3/4-inch wide without any hassle. Its lightweight and compact design make the hedge trimmer easy to maneuver without causing much fatigue to the operator. However, if you want a less expensive hedge trimmer, you can opt for the BLACK+DECKER BEHT100 Hedge Trimmer,​​​​​ it’s also very compact and suitable for trimming of small hedges and bushes. It’s lightweight and compact design complemented by a T-handle and a full-length trigger offer comfort and control while cutting. The DEWALT DCHT820P1 also stands out in its category with the use of a 20V Lithium-ion battery that lasts longer than Ni-Cad batteries used in other hedge trimmers. Its hooked-tooth blade is made from steel, making it a more durable option than other options.